During the Mesozoic period (and even stretching back to the Permian), reptiles coontinuously invaded the seas. One of the first marine reptiles was Mesosaurus, an Early Permian anapsid with needle-like dentition. During the Triassic period, an enormous range of marine forms developed, primarily belonging to two distinct groups--the Ichthyopterygia and Sauropterygia. But even as these more basal forms filled the oceans, still more reptiles poured into the sea. During the Jurassic period, crocodilian archosaurs invaded nearshore environments, and during the Cretaceous period, varanid lizards got in on the action, producing some of the largest predatory marine animals to ever exist. In this post, I will examine three very distinct groups of Mesozoic marine reptiles, all of which produced species well suited for large-game hunting. Far from being strictly picsivorous, these animals were the ones to look out for while diving (or snorkling) in the Mesozoic seas. The Sauropterygia developed into a menagerie of forms, including pistosaurs, plesiosaurs, and placodonts, but one of the more understated groups are the thalattosaurs. These near-shore lizard-like creatures grew fairly long (two meters or so) and probably lived a life similar to that of the modern marine iguana (Amblyrhynchus cristatus). Anguilliform swimmers, the thalattosaurs had long, flexible bodies and short but stocky limbs. They are divided roughly into two main groups: Clazariids and askeptosaurids. The former have bizarre downturned snouts and vomers, and their diet is problematic because of that. Askeptosaurids, however, were predators through and through. Askeptosaurus italicus and Anshunsaurus huangguoshuensis are the best-known species within the group, and while they certainly would have snacked on fish, the large, recurved teeth lining the jaws suggest a more varied diet. Additionally, the skull of Askeptosaurus has plenty of room for jaw muscles. Note the large recess behind the orbit, where jugal simply fails to connect to the back of the skull. The bump on the lower jaw also suggests a muscle attachment point, and unlike other sauropterygians, Askeptosaurus may have possessed a sizeable adductor mandibulae muscle, allowing the jaws to snap shut strongly and quickly. The recurved teeth may imply a method of feeding enjoyed by mosasaurs, varanids, dromaeosaurs, and allosaurs--that is, grabbing a chunk of from a victim and running, leaving the prey to bleed to death and/or go into shock. But what would Askeptosaurus be eating? Ichthyosaurs and other basal sauropterygians are a possibility. By the Late Triassic, enormous ichthyosaurs (Shonisaurus) were already swimming the seas. During the Jurassic, crocodilians briefly took to the sea. 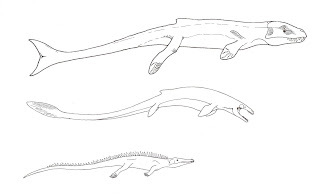 Like thalattosaurs, thalattosuchids can be divided into two groups: the gharial-like teleosaurs (above), and the far more menacing metriorhynchids (below). Although not terribly closely related to actual gharials, the teleosaurs evolved long, slender jaws with needle-like teeth. Their bodies are dorsoventrally compressed, and the limbs are more laterally placed on the body than gharials, with surprisingly short forelimbs. Teleosaurs kept their dorsal armor, but augmented it with significant ventral armor. They were mid-sized crocodilians, about the size of the average American alligator. Their dentition reveals teleosaurs to be specialized fish-eaters. Among the most fearsome creatures in the Jurassic sea, however, must have been Dakosaurus andiniensis, a giant South American marine predator. D. andiniensis is very much unlike its sister species, D. maximus, so much so that I wonder why it didn't recieve a separate genus. While most metriorhychids were fish and cephalopod feeders, D. andiniensis must have been able to eat whatever it wanted. At six meters in length, the beast could have fed on fish, cephalods, ichthyosaurs, plesiosaurs, and sharks. Dakosaurus andiniensis' skull is short and massive, quite unlike its metriorhychid cousins. The large frontal (prefrontal?) 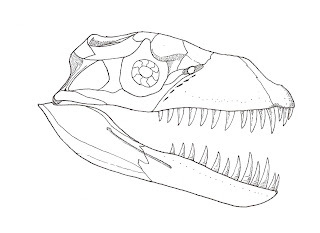 bone projects laterally outward as sort of a palpebral immitation, giving Dakosaurus a sort of "eyebrow" bone. The jaws are huge, with plenty of room for powerful jaw muscles. Additionally, the teeth are ridiculously long and large, and reminds me of Ceratosaurus' oversized dentition. Dakosaurus' teeth are serrated, and the teeth of the premaxilla are noticably shorter than those of the maxilla. I am reminded somewhat of Tyrannosaurus rex' teeth, all of which are huge, but the teeth of the premaxilla are smaller and more tightly packed than those of the maxilla. Given the obvious strength of the teeth, skull, and musculature, one wonders if Dakosaurus andiniensis was able to slice through flesh and crush bone. Metriorhynchid thalattosuchians had a unique body plan. The body is devoid of armor, and the end of the tail is downturned, indicating the presence of a vertical tail fluke. Metriorhynchids may have also had a short dorsal fluke. What's really odd, though, is that the forelimbs became incredibly short and stocky and would have resembled muscular "flappers" rather than true flippers in the mode of, say, mosasaurs or ichthyosaurs.The hindlimbs, however, were long and lean, with elongated metatarsals. They, too, are completely unlike the flippers of other marine reptiles. Metriorhychids probably swam in a manner similar to modern crocodilians, with the limbs folded against the body, only to be used for maneuvering. With the extinction of most ichythosaurs and plesiosaurs at the close of the Jurassic, varanid lizards took advantage of this ecological vacuum and invaded the Cretaceous waters, eventually becoming the mosasaurs, giant predatory monsters who ruled the seas until the end of the Mesozoic era. These beasts grew from between two and fifteen meters, and probably ate whatever they felt like, including other mosasaurs. The creatures are unique in a number of ways, but especially in terms of skull anatomy. 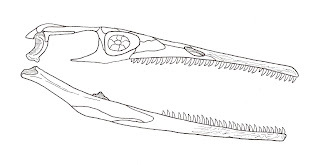 The mandible is double-hinged, allowing the dentary to slide back and forth and outward, allowing the mosasaur to engulf large prey items and swallow them whole. Aiding in this effort was a double-row of sharply recurved palate teeth, which, along with the motions of the jaw and tongue, would have "pulled" the prey deeper into the animal's gullet. Clidastes prophyton was a fairly typical, if small, mosasaur from Kansas. Like Askeptosaurus, Clidastes has a recess behind the orbits, suggesting very powerful jaw muscles. Also like thalattosaurs, mosasaurs were anguilliform swimmers, but unlike thalattosaurs, they were fully marine and would have been unable to come ashore. With the close of the Cretaceous period, only one branch of marine reptile survived: the turtles. They became fairly diverse during the ensuing Cenozoic, only to face gradual extinction during the current Holocene with the rise of humanity. The predatory roles once dominated by thalattosaurs, thalattosuchids, and mosasaurs are now in the hands (fins?) of sharks and whales. Postscript: Thalattosaurs might not be sauropterygians. They are usually considered close to that group via good deal of hedging, but after reading a paper on sauropterygian skull morphology provided by Neil, I believe that even if they're not sauropterygians proper, thalattosaurs must be darn close, and a lot closer than they would be to ichthyopterygians. Also, as you'll see in the comments, Will mentions that a few ichythosaurs and plesiosaurs did push through the J/K boundary, so they weren't entirely absent. Finally, Dakosaurus is one of the few inherently evil tetrapods on the planet. It would not hesitate to eat a baby. Gleefully. With some adaptation, that Dakosaurus could probably become an entry in the Archosauria show. Which we prolly need to meet about (we, who be the principal artists). You made me go crack open my Hallam and Wignall again. Ichythosaurs died out some time in the Cenomanian (genus Platypterygius surviving, apparently w/ 6+ species). There seems to have been a minor mass extinction in the marine environment - 7% of marine families and 26% of genera croaked - near or at the Cenomanian-Turonian boundary. (or here if the URL is too long). Plesiosaurs kept going to the KT Boomski. There are two schools of thought about the Plesies in the Cretaceous. One,a nd more traditional, is that they declined. Others are arguing that they didn't due to some more recent fossil finds arguing that it's just been a fluke of too few samples to give a statistically accurate picture. IDK which is really the case. The mosasaurs didn't show up until the Turonian, after the CT extinction. Right. Thanks, Will. I'll have to change the post around a bit before I submit it to Linnaeus' Legacy later today. Mass Extinctions are My Thang. It's funny. I encountered a guy online that was a total whacked out trip. He was a mammal, even placental mammal, supremacist (!!). he was almost a determinist with his beliefs on evolution, but not a deist either. He used to rant about how he considered 'certain' events mass extinctions (even though he obviously didn't understand the term) and the doom (doom!Doom!DOOM!) of the ichythosaurs was one he used to claim he was right about and no one else was. It was a mass extinction. (minor one) The fish lizards did get it in their tails. Permanently. However, just because THEY died it doesn't mark the occasion as a ME. They just happened to be victims at the time. The funnier part of it was that the fact that his claimed "enlightened knowledge" that a mass extinction happened then was accepted, old story by the ME studying crowd albeit for different reasons. D. andiniensis is very much unlike its sister species, D. maximus, so much so that I wonder why it didn't receive a separate genus. I believe Dakosaurus andiniensis was originally described from isolated teeth, and its unusual appearance didn't become known until the later discovery of skull material. (This might also go some way to explaining why it got the rather dull name of "andiniensis" rather than the much more appropriate "stercusstercusmoratoriussum".) Even after the discovery of cranial material, though, the two Dakosaurus species still form a clade, so dividing them up wouldn't actually be much more informative. Nice work Zach, fun to finally see all the skulls lined up together! And it's exciting to finally see thalattosaurs getting some good press, since I'm still too lazy/tired/distracted/sick to get around to it, did I mention lazy? If you have a reference that puts Thalattosauriformes into Sauropterygia proper I need it immediately! Otherwise, it's probably worth noting that while thalattosaurs were probably closer to sauropterygians than ichthyopterygians they technically don't belong in either of those groups but are, as it turns out, enigmatic hellasaurs of somewhat uncertain placement. While I have no doubt that Askeptosaurus might opportunistically go after small marine reptiles, perhaps even those approaching its own size, I'm just a wee bit skeptical that its 1cm teeth would be adequate tools to bleed out a Shonisaurus. There were lots and lots of fish in Monte San Giorgio fauna, many were quite large and well defended, and I'd but a pretty heavy bet down that Askeptosaurus was predominately a fish eater. Quibbling aside, props again on the drawing and raising awareness on some neglected groups! Zach, Dyrosaurs made it till at least the eocene. They aren't as adapted as, say, metriorynchids, but they are found in marine deposits. Also, are mosasaurs now considered varanids proper? No, mosasaurs are actually more closely related to snakes, while mosasauroids and snakes together form the sister group to varanoids.